Congratulations! 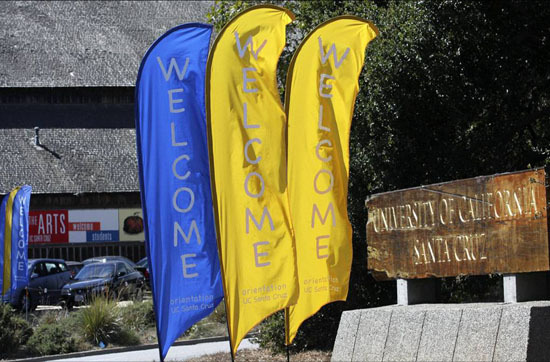 The entire UC Santa Cruz campus welcomes you and your family to a community of scholars, innovators, risk-takers, and visionary world leaders. We know how exciting and intimidating it can be to join a new community; that is why we created Slug Orientation. Slug Orientation is designed to help you get into the Slug spirit by guiding you through the entire process. Including: navigating the campus, preparing for class enrollment, making connections with other students, and getting your questions answered. Welcome to the Banana Slug family! Slug Orientation is designed to assure you start strong from day one. Slug Orientation is the next step for all new students. It consists of completing a series of online courses (during June, July and August), meeting deadlines, and participating fully in Fall Welcome Week. Slug Orientation Canvas course links will be sent directly to your UCSC email account. You will receive individual links for each course (one in June, one in July, and one in August). Learn how to use Canvas by going to Getting Started with Canvas and review the Canvas FAQ for Students.